At Casa Lola, we have deliberately been avoiding the 2014 winter Olympics coverage, but I confess that our resolve kinda flies out the window when it comes to hockey. Not only is Olympic hockey the *best* hockey to watch, in our opinion, but it really is THE sport to watch at our house. I mean – we ARE Canadian! 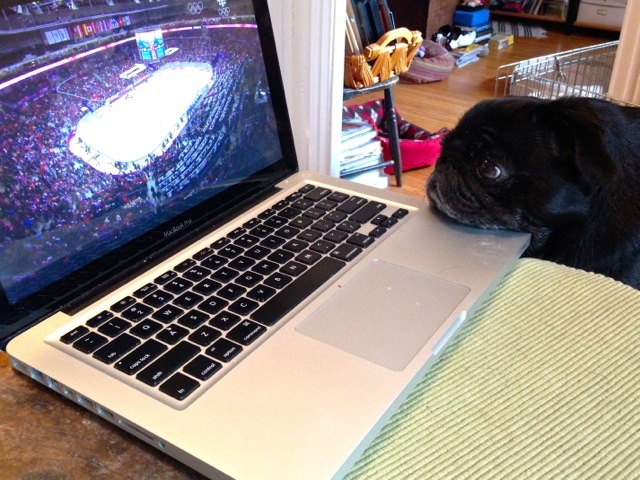 You getting ready for the game, Pug? Once the action starts, Lola Pug gets very serious. So I don’t need to tell you what we’re up to this morning. With our formidable and truly awesome women’s team holding gold medals, we’re all set to cheer on our men as they do their best to play like the girls today. 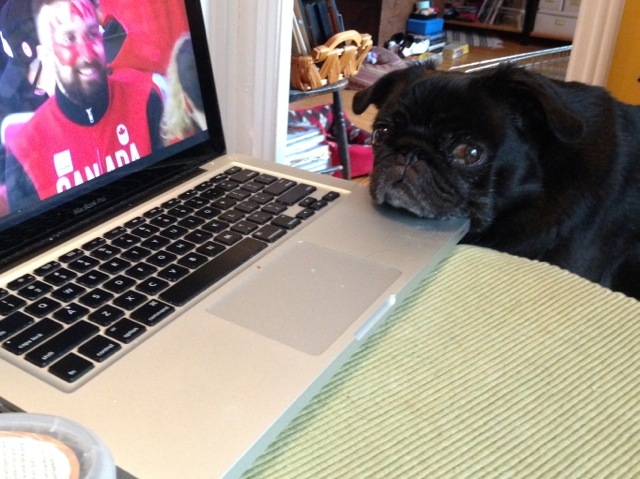 The whole country – and a little black pug and her bleary eyed mama – are all rooting for our hockey boys today. That is hilarious. Tallulah actively watches Dancing with the Stars. She follows the movements like Lola does. No buffing though. She reserves that for animals on TV she doesn’t like. Congratulations (we think?) on winning? At least, that’s what we read on Twitter. Apparently, we have a number of Canadian pug friends. Wow, Lola Pug! Such concentration to follow the puck! Lola Pug on the Montreal Dog Blog!